Introductory level course is an ideal first step in training and will teach you how to apply makeup, the basic practical and technical skills of make-up artistry you need to successfully start out in the industry. 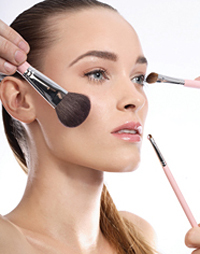 With practical sessions taught in a relaxed atmosphere, you will learn the key techniques required to create successful beauty make-up styles and will gain an understanding of basic make-up. Students have access to luxury and professional make up brands, however, you need to bring your own brushes. If you do not have a brush set you can purchase one from MAKE UP ATELIER. © Make Up Atelier 2012. All Rights Reserved.